Traditionally hosted by Durham Harriers and settled for a number of years at Maiden Castle Sports Centre, this year’s event looked likely not to happen, however, till Birtley AC stepped in to fill the gap left by the struggling hosts in December. In the event, the new course – two laps of approximately 3,000 metres in total and taking in two sharp ascents and descents on each lap – was felt by many to be a better cross country challenge, even if strong winds made for uncomfortable spectating. Morpeth’s Senior and Veteran women, Senior men and Over 55 men were all winners on the day, with their Over 45 men and women in second and third places respectively in their age categories. A late withdrawal from the Senior women’s team saw a game Robyn Bennett, attending ostensibly to support her competing parents, step in to fill the gap and she proved a more than adequate substitute as she came home in second place at the end of leg 1. Another gutsy run by Lorna Macdonald on leg 2 kept the club in touch with leaders Gateshead Harriers, and it was left to Jane Hodgson, returning to her best form, to reel in the three athletes ahead of her. This she did in some style with the team finishing in an overall first place in a time of 35m 12s, some 30 seconds ahead of their nearest rivals. Hodgson also recorded the fastest Over 35 time of the day, which was also the second fastest women’s time overall. The club’s B team of Alison Brown, Jane Briggs and Gracie Hufton also achieved a top 10 finish, their time of 38m 29s putting them in ninth place. Special mention should be made of Jane Briggs who, as an Over 50 Veteran, ran the second leg for the team. Like their Senior club colleagues, Morpeth’s Veteran women also produced a dominant performance, their time of 36m 1s in fact putting them in third place overall on the day, the Senior and Veteran races being held at the same time. On leg 1, Morag Stead ran the fastest O/45 time of the day and she was ably supported by Helen King and Gemma Floyd. The loudest Morpeth cheer of the day, however, was undoubtedly for Morpeth’s O/45 women, the team of Jill Bennett, Fran Naylor and Sue Smith finishing in 45m 38s for a bronze medal in their category. 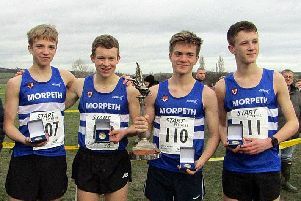 The Senior men’s race saw Morpeth teams finish in first, second and eighth places and certainly bodes well for bigger challenges ahead nationally over the next few weeks. First leg runners Sam Charlton, of Wallsend, and Chris Parr, of Jarrow, took an early lead, but Morpeth youngster Alex Brown proved he was in no way overawed by the competition around him as he led off for the A team and kept the club in contention with a very sensible and measured run. With George Lowry able to reel in those ahead of him on leg 2, it was left to Carl Avery to anchor the team to what was in the end quite a comfortable victory in a time of 27m 59s, Avery’s clocking of 9m the fastest time of the day. Behind the A team there was an exciting tussle for second place between Morpeth’s B string of Jordan Scott, Ross Floyd and Tom Straughan and teams from Tyne Bridge and Gateshead. In the event, Morpeth’s men proved too strong for both clubs, with Straughan able not just to hold off James Dunce, of Tyne Bridge, behind him but also to take time out of him. The team’s final clocking was 28m 46s. 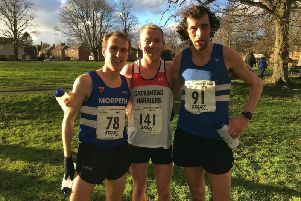 Not far behind, Morpeth’s C team of Ali Douglas, Dean Lonsdale and Karl Taylor finished a highly respectable eighth (30m 39s), ahead of the A teams of most clubs. Morpeth’s Over 55s again proved the best of the bunch in the male Veterans competition, the team of Dave Nicholson (fastest Over 60), Paul Bellingham and Neil Macanany proving much too strong for nearest rivals Low Fell. The Over 45s picked up a silver medal, but were unlucky to come up against a strong Sunderland Harriers team to whom they lost out for first place, Lee Bennett clocking the team’s fastest time of the day. Ironically, this also meant that the Bennett family went home with a full set of medals. Morpeth Harrier Amy Lott performed superbly at the Sheffield Indoor Arena on Saturday, when finishing an agonising fourth in the final of the Under 17 women’s 60m hurdles, in the first day of competition in the Northern Athletics Indoor Championships. Posting a lifetime best of 9.11s (equal ninth in the UK, and equal second for a first year Under 17), she just missed out on a bronze medal behind Doncaster’s Nicole Lannie (9.06s). Event winner Abigail Pawlett, of Stockport, and Silver medallist Melissa Coxon also posted lifetime bests of 8.66s and 8.94 respectively, which place them first and third in the current UK rankings. Despite just missing out on a medal, Lott can feel justifiably pleased with her performance, a factor which also pleases her devoted coach Dave Thomas, who unfortunately missed out on the occasion due to him having to attend a UK Athletics coaching course. Fellow North East athletes Charlotte Rutter and Philippa Ellis, of Darlington and Gateshead respectively, both second years in the age group, also made it to the final. Rutter finished sixth in 9.20s, while Ellis trailed in a disappointing eighth and last in 12.99s, after unfortunately injuring herself at the third flight of hurdles. Lott’s performance will obviously prove encouraging, as she tackles other indoor championships. Morpeth Harrier Rory Leonard certainly played his part in a superb display of flying Brits in Sunday’s IAAF Cross International Juan Muguerza Under 20 men’s event, held in Elgiobar, in Spain, when he finished an excellent fifth in a 61-strong field of finishers. Leading the field home was fellow Brit Zak Mohammed, who beat another Brit Euan Brennan by four seconds. Leonard was a further nine seconds behind two battling Frenchmen. Posting a time of 72m05s, Morpeth Harrier Andrew Lawrence finished eighth behind fellow North Easterner Adrian Bailes, of Birtley AC, in Sunday’s Brass Monkey Half Marathon, held in York. Bailes posted a winning time of 69m42s, which gave him a new personal best, beating his old figures by nearly nine minutes, set in last year’s Great North Run. Other Morpeth Harriers taking part in the event were Ian Harding, who finished 63rd in 78m38s, and Lesley Chapman, who finished 862nd in 110m15s, and was second Over 60 woman.